Read articles and interviews about my visit to a Parallel Timeline. You may be directed to the original webpage of the article or interview by clicking on links. 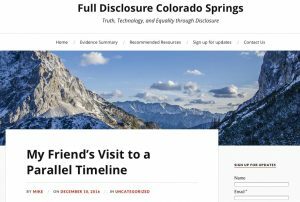 Full Disclosure Colorado Springs Blog Article by Mike Waskosky.